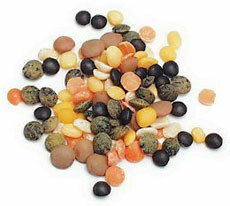 Mixed lentils: black, brown (looks tan), ivory, green (speckled), red (looks orange) and yellow. Photo by Hannah Kaminsky | THE NIBBLE. Here are terms including kamut, kañiwa, lentil, kidney bean and lima bean. If you’d like to suggest additional words, use the Contact Us link on this page. See our 60 other food glossaries. Kamut is a trademarked term for khorasan, the Ancient Egyptian wheat (see below). Kamut has a larger kernel than wheat and contains higher levels of protein and slightly higher levels of lipids and minerals. It is grown organically and can be purchased for use as a breakfast cereal and for bread baking. In American English, kasha is roasted whole-grain buckwheat or buckwheat groats (see groats, above). In Slavic languages, kasha does not refer specifically to buckwheat groats, but to porridge in general (although buckwheat was one of the earliest porridges). A classic Jewish “comfort food” dish, kasha varnishkes, combines kasha, bow tie pasta (farfalle), onions and mushrooms. See groats. Khorasan the Ancient Egyptian word for wheat. It is considered one of the original strains of wheat and was used in ancient times for bread making. It is believed to have originated in the Nile Valley in Egypt about 6,000 years ago. The flour made from ground kañiwa. 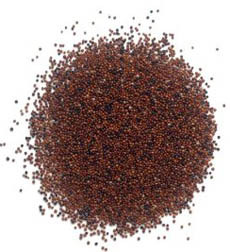 Kañiwa is closely related to quinoa, and is used in similar preparations. A hardy plant that can withstand cold temperatures, it grows in the mountains of southern Peru and Bolivia. Its numerous seeds are 1 millimeter in diameter and are dark brown to black in color. It is very high in protein with sulfur-containing amino acids; however, unlike quinoa, kañiwa has no saponins, phytochemicals that seem to reduce blood cholesterol levels and the risk of cancer and stimulate the immune system. Kañiwa can be purchased from Amazon.com. Familiar to almost every American, these beans find themselves in baked beans, chili, refried beans, three bean salad (along with string beans and wax beans), Cajun bean dishes and stews. red kidney has made a name for itself as a chili bean. 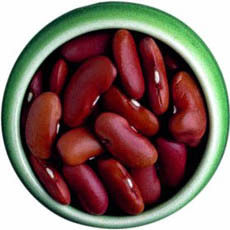 The most common is the dark red kidney bean, Phaseolus vulgaris, which has no markings (unlike the more elegant kidney beans shown in the photo); but there are numerous varieties, including light red kidney beans. Kidney beans available at Amazon.com. The edible seed of certain leguminous plants, a class of vegetables that includes beans, peas and lentils. Legumes are typically low in fat, high in fiber, cholesterol-free and high in folate, iron, magnesium and potassium. They’re also a good source of protein and can be a fat- and cholesterol-free substitute for meat. Examples include beans, chickpeas, lentils, peas and split peas. Beans and lentils are very low in fat, high in fiber and are frequently referred to as “wonder food.” Examples include adzuki beans, anasazi beans, black beans, black-eyed peas, chickpeas, edamame, fava beans, lentils, lima beans, red kidney beans and soy nuts. Lentils are the seed of a small shrub and is dried after harvesting. Lentils have been eaten for over 8,000 years and originated in southwestern Asia along the Indus River. It is a staple food for many South Asian cultures.Tiny, flat and round, lentils are the fastest cooking of all dried beans that yield a rich, earthy flavor when cooked. The three major varieties are Le Puy, the most intensely-flavored lentil, a tiny green-blue lentil grown without fertilizers in the area around Le Puy en Velay, France, which have a delicate flavor and hold their shape very well; the common green or brown lentil; and yellow and red lentils, which are a staple in Indian cooking, from the spicy Indian dish daal or dal, lentil curry, to the lentil bread daal poori. One can also find ivory lentils, golden lentils and black beluga lentils, so called because they are said to resemble pearls of beluga caviar. Lentils supply a large dose of folate (folic acid), which fights heart disease and prevent birth defects; as well as providing fiber, protein, potassium and magnesium. Lentils are fat-free and absorb spices easily. Versatile, they are used in soups, stews, salads, side dishes. 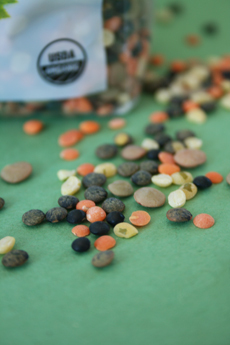 Mixed lentils, showing black, brown (looks tan), green (speckled), ivory, red (looks like orange) and yellow, available from Amazon.com. Among the most popular shell beans in the U.S., these smooth, flat shaped, sweet-tasting beans have a rich, starchy, meaty texture and a creamy, distinctive flavor. 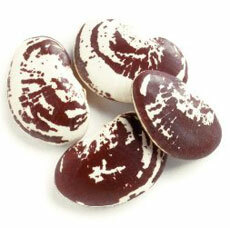 Lima beans are nutrient-dense and their richness generates feelings of satiety. 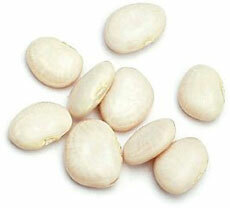 Often referred to in some southern states as “butter beans,” lima beans date back to around 5000 B.C.E. along the coastal regions of South America; they are believed to have originated in Guatemala and Southern Mexico and are called lima after Lima, Peru, where they were discovered by the Spanish in the 1500s. Spanish explorers brought the lima bean to Europe, where it thrived in the temperate climate; the slave trade brought it to Africa. where it became one of the most vital beans on the continent. Fresh varieties of lima bean sold in their pods can sometimes be found in local markets. Before European settlers reached the Americas, a type of bean believed to be similar to the lima bean was grown by Native Americans in the southwestern and East Coast regions of the U.S. These beans were commonly inter-cropped by Native Americans with corn; hence, the origin of succotash, a side dish that combines lima beans and corn. Limas are also used in casseroles, soups and salads. Lima beans were traded along routes that led into North America; eventually they were carried to Europe, Asia, and Africa. Early explorers stored dry lima beans for long periods on their ships, recognizing that they were a nutritious and highly concentrated food source. In fact, lima beans are a good source of B vitamins (vitamin B6, niacin, folate), protein (including the important amino acid lysine), fiber (especially soluble fiber in the form of pectin), iron, potassium, and magnesium; and they have very little fat. Studies suggest that intake of beans can help to lower LDL cholesterol levels, probably due to their soluble fiber content. 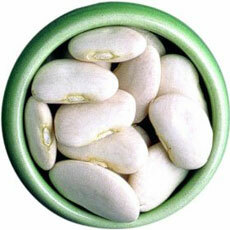 Lima beans also contain the phytochemicals coumestrol and saponin, compounds that may impart anticancer benefits. One of the most widely available beans, lima beans come in two sizes: large, flat lima beans (the Giant Peruvian Lima, Phaseolus limensis), also called the butter bean, cape pea, curry bean, lab bean, Fordhook, Madagascar bean or Pole Bean. The other is the baby lima or baby butter bean, which is not a young lima bean but a smaller, milder-tasting variety. Both are sold frozen as well as dried and canned. Beyond Fordhooks and baby limas, there is wide variety of seed sizes, shapes and color combinations among lima beans (see the Christmas lima photo at right), but they are less available. Baby lima beans are less starchy than the larger Peruvian/Fordhook variety. Generally, the greener the thinner bean, the better the texture and flavor. Giant	Peruvian lima beans available at Amazon.com. Christmas lima beans available at Amazon.com. Baby butter beans available at Amazon.com.